Pristine beauty, majestic mountains and ancient glaciers are seemingly within arm's reach as you near your glacier destination! One hundred Alaskan Huskies wait to share this essential part of Alaskan culture mushing! Experienced guides will talk to you about their backcountry racing experiences and answer your questions as the team is hooked up, and then - you're off! 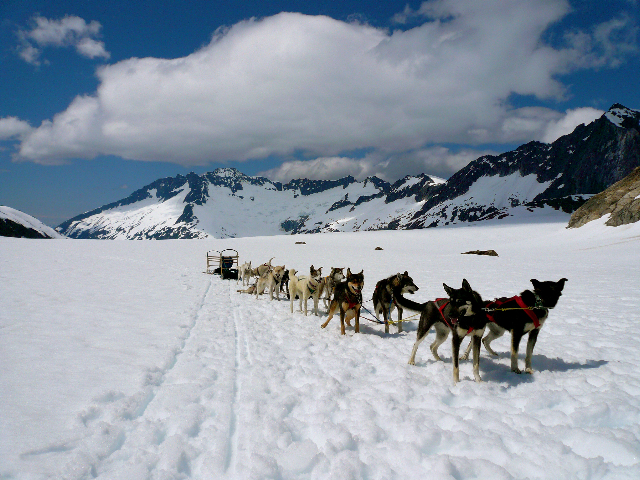 Imagine standing on the runners of a dog sled with a team of huskies loping across the ancient snowfield, nestled among the peaks of the Juneau Ice Field. The lure of the trail and the thrill of driving a dog team create the Ultimate Experience of a Lifetime! A tour truly for EVERYONE! Passengers ride seated on the sleds, with the option for one passenger at a time to stand on the runners to get an idea of how it feels to actually drive. The professional musher is always in control of the dogs. No minimum fitness level required. Please dress with warm water-resistant coat, hat, gloves and protective foot gear. If you don't have it, we do. Flight times and routes may vary slightly due to inclement weather or other safety concerns. Please allow approximately 3.5 hours from when you are picked up. There is a no bag policy for the helicopter; it is a safety issue and an extension of an FAA policy regarding unsecured baggage in the aircraft. All items taken on board must be in pockets or in something like a waist pack, no backpacks, purses, bags, camera bags. Bins are available where you can leave a bag(s) during your tour. The tour facility is staffed at all times for security, however the bins are not locking. Please indicate the weight of each participant in the comment section of the order form. For those guests weighing more than 280 lbs you will need to book the "280lb+ Adult" ticket. Children weighing under 40 pounds will require a car seat. This tour is weather dependent, generally shutting down for the season anywhere from early to mid September. If the Dog Sled operation is shut down due to snow levels, we will convert you to the above and beyond Helicopter tour. The weight restriction is 280 pounds (clothed weight, including cameras, shoes, coat, etc.). Passengers 280 pounds or more need to book the "280lb+ Adult" ticket. Please indicate weight of each participant in the comment section of your order form. Due to weight and space limitations for the helicopter, persons weighing 280lbs or more will need to book the Helicopter Dog Sledding tour with supplemental fee. As you are weighed prior to flight, please be advised that if the supplemental fee has not been paid in advance, the supplemental fee will be charged prior to boarding, and depending on availability of seats you may be denied boarding and no refund will be issued. The dog camp is about the 3800 foot level,and the helicopter can reach heights of up to 5000 feet, possibly a bit more. Children weighing less than 40 pounds will require a car seat. Please advise when placing your tour request if you will need the tour operator to provide a car seat. Due to safety reasons lap children are not allowed onboard the helicopter. PLEASE NOTE: There is a no bag policy for the helicopter, it is a safety issue and an extension of an FAA policy regarding unsecured baggage in the aircraft. All items taken on board must be in pockets or in something like a waist pack, no backpacks, purses, bags, camera bags. Bins are available where you can leave a bag(s) during your tour. The tour facility is staffed at all times for security, however the bins are not locking.